Christian Kroos, Mark D. Plumbley (2017). 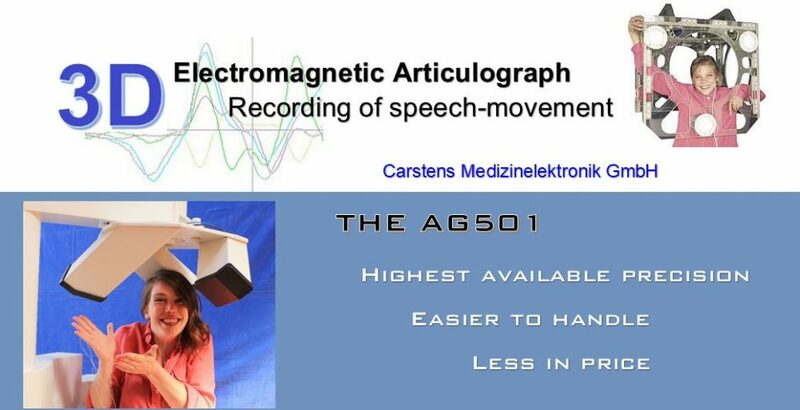 Using electromagnetic articulography with a tongue lateral sensor to discriminate manner of articulation. The Journal of the Acoustical Society of America, 141(1), EL57-EL63. Katz, W. F., Mehta, S., Wood, M., & Wang, J. (2017). The effects of English (L2) language proficiency on speech motor indices for bisyllabic bilabial word utterances in typical Kannada (L1)–English (L2) bilinguals. Speech, Language and Hearing, 1–9. Mahesh, B. V. M., & Manjula, R. (2016), All India Institute of Speech and Hearing, Mysore. Prof. Dr. M. Bertsch of the University of Music and Performing Arts Vienna (Austria) published in cooperation with PD Dr. P. Hoole of the LMU Munich (Germany) some fascinating movies using the AG501 for visualizing tongue movements of trumpet and clarinet players in slow motion. Die Elektromagnetische Artikulographie (EMA)- dynamische Analyse und Wiedergabe von Sprechbewegungen auf dem Computerschirm. Physiologische, aerodynamische und akustische Verfahren in der Dysarthriediagnostik. The role of the syllable in speech production. Evidence from lexical statistics, metalinguistics, masked priming, and electromagnetic midsagittal articulograhpy.